At Sun ‘N Fun we offer Martha’s Vineyard’s Best way to travel the Island. Call us to make reservations and we will pick you up in the car of your choice. Our Jeep wranglers are a great choice for groups of 2-4 that want to see the Island with the wind in their hair. The sports cars are ideal for couples wanting to travel the vineyard in style. If you have a large Group we also have Vans & Suv’s so you can fit the entire group for your trip. Offering great prices for Daily, Weekly and Monthly rentals. Our selection of new Jeep Wranglers, Convertibles, 4-Door Car, SUV’s and Mini-Vans will meet your needs for a car rental on Martha’s Vineyard. We also offer child seats free of charge. 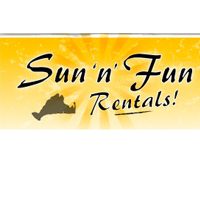 Sun N Fun is located in the heart of Oak Bluffs, close to the towns Ferry Terminals. We offer free pick up service to our customers who arrive in Vineyard Haven, at the Airport, or at your Hotel. See Martha’s Vineyard in one of our clean, comfortable vehicles and make your own schedule around the island. Enjoy 6 diverse towns 7 beautiful beaches. Our knowledgeable staff will share some Island history and Folklore. Since 1982 we have consistently been the leader offering the best in prices and Services.